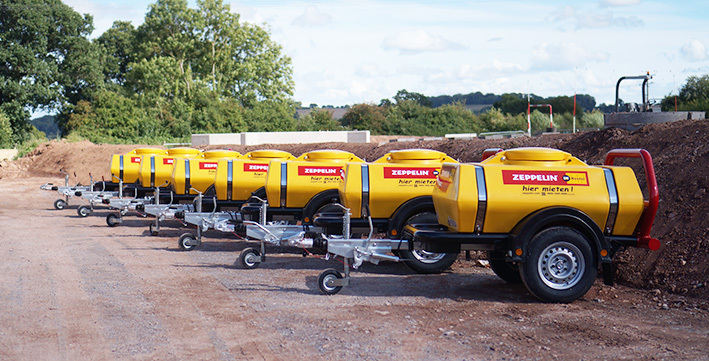 Brendon Powerwashers have just met an increased order from Zeppelin, the German Hire rental company, for extra Brendon Water Bowsers and Brendon Bowserwashers. These will be delivered to Zeppelin Rental sites across Germany, The accompanying photograph shows one of the latest batches of machines ready for dispatch, all dressed in their Zeppelin Rental company livery. Brendon Powerwashers have been supplying the Zeppelin company for the best part of a decade, and these latest orders are a further endorsement of the Brendon Pressure- Washer reliability and speaks for its durability in the European Rental market. The advantage of the Brendon Pressure-Washer tank is that it is fully baffled and can be towed safely by any vehicle without creating instability by excessive water movement. The tanks’ capacities are of a 1000 litre value and each is mounted on a chassis which complies with all EU Trailer requirements. The tank is ready to use, and is fully equipped with a towing facility and all road legal lighting for use in the EU. In addition to the above, Brendon Power-Washers can also supply the above with a pump option which is of particular value in the horticultural industry where watering of plants within glass-houses as well as in the outdoor environment – which makes the installation of mains plumbing a thing of the past.. A useful addition for the horticultural market are the accessories of watering lance and attachment which make watering easier. The photograph shows the Water Bowsers in the Zeppelin livery, but Brendon Power-Washers can accommodate any colour and livery and are happy to do so. The Water Bowser is not the only option that Brendon offers. The company also manufacture a fully mobile unit, with Water Bowser, pump, engine 0etc all in one mobile machine – complete with hose reel and full towing equipment. These can all come with lift points, enabling the powerwasher to be lifted to heights will above the ground.